eFulfillment Service (EFS) is the trusted choice for UK-based merchants looking to grow their online businesses with U.S. customers. 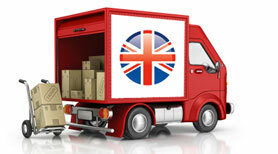 Why do retailers in the United Kingdom consistently choose EFS to handle their U.S. fulfilment needs? Our fulfilment warehouse is strategically located between the East and West coasts of the United States, allowing you to effectively reach all of your U.S. customers from one fulfilment center. Our UK clients maintain constant visibility and control over their U.S. fulfilment operations with our web-based technology. We integrate our fulfilment system with your shopping cart for free, making order processing fast and easy, and allowing you to track packages and inventory in real-time from anywhere in the world. With over a decade of servicing UK-based merchants, we understand the needs of businesses like yours. Our processes are simple and transparent. There are no setup costs, no minimums, and no long-term contracts. You have a dedicated customer service team at EFS, and we provide free support via our 24/7 ticket system. Discover why eFulfillment Service has become one of the most trusted and reliable fulfilment centers in the USA. Get a quote today.